Let us see if the new Lakme Complexion Care CC Cream SPF 20 is suitable for acne prone skin or if it can cause pimples. We can do that with our free online tool Skingredients Online that will tell us instantly if Lakme CC Cream contains any pore-clogging (comedogenic) ingredients or not. It combines the goodness of your daily skin cream with just the right touch of make-up to give you that perfect look in just a few minutes. Its skin care benefits include sun protection (SPF 20), moisturizing, brightening and freshness while its make-up benefits are an even skin tone and basic coverage. It claims to be suitable for all skin types. It comes in two shades – Beige and Bronze. This is the ingredient list given on the packaging. Copy paste the ingredients in this Skingredient Online tool. 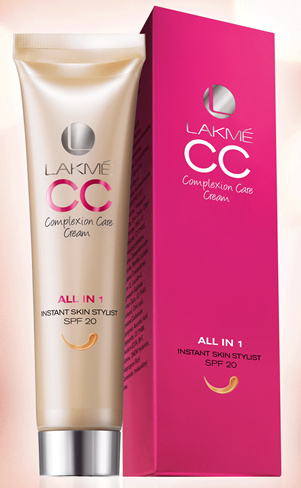 This is what Skingredients instantly found out about the suitability of Lakme CC Cream for acne prone skin. It means that the product contains a couple highly comedogenic ingredients stearic acid and palmitic acid. It also contains some mildly comedogenic ingredients. A mildly comedogenic ingredient means that it is not likely to clog pores or cause pimples unless your skin breaks out very easily. It is most likely safe for APST 1 or APST 2 but maybe not for APST 3. A highly comedogenic ingredient means that it is very likely to cause pimples even on skin that does not break out easily. If you use a product containing a highly comedogenic ingredient, you will most likely get pimples. Lakme CC Complexion Care Cream is unsafe for acne prone skin. You may not see pimples the very next day, but this product can keep building up into the pores, so you could slowly start seeing more and more pimples with regular use. Now what are you waiting for? Head over to the Skingredients Online tool and test if your next purchase of skin care or makeup could break you out.